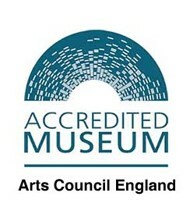 The museum received full accreditation from the Arts Council for England (ACE) on 5 October. This means that we have met national standards as set by the Arts Council on management, care of the collection and engaging with our audiences. As well as being an essential benchmark, we have to meet these standards to qualify for services such as training courses and for access to grants and funds. new arrangements for day-to-day governance, allowing faster decision-making by the management team. the development of outreach programmes, including our essential volunteers stewards, summer internships for GCSE-level students. We are developing a schools programme, have held several public lectures and private tours and have extended the availability of our collection via the internet. a substantial increase in curatorial resources, including the use of training and grants provided through the South East Museums Development Programme and the National Army Museum. These have also allowed us to make major improvements to our cataloguing, care and display of artefacts and records.